Our Firm is more than the sum of our Founders, Partners, lawyers, staff, clients, family and friends. So to take stock of a quarter of a century of our founding, we sought a plurality of ways that reflect our collective personality to give thanks to our community. These activities kicked off in August 2017 to November 2018. In three different occasions, we liaised with the City Legal Office of the local government of Makati and conducted free legal aid to its constituents. Between December 6, 2017, February 21, 2018, and April 25, 2018, a total of 355 indigent residents sought our assistance for a variety of legal concerns. Partners Myls Creencia and Maricar Lazaro with a client during the Firm’s legal aid clinic on December 6, 2017 at the City Legal Office of Makati. 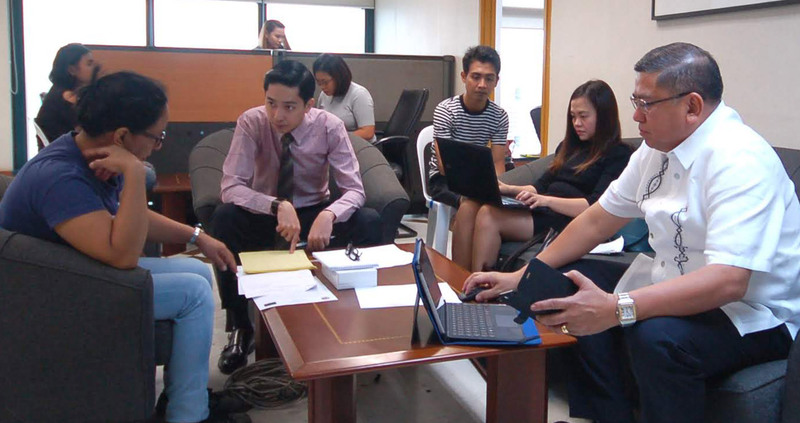 John Medina (in purple shirt and tie) conferring with a client as Tine Ferrer and Dicky Salazar work on their laptops during the December 6, 2017 legal aid. All the lawyers and staff who participated in the December 6, 2017 legal aid clinic at the Makati City Hall. Senior Partner Sig Fortun in deep work with a client during the December 6, 2017 legal aid clinic. 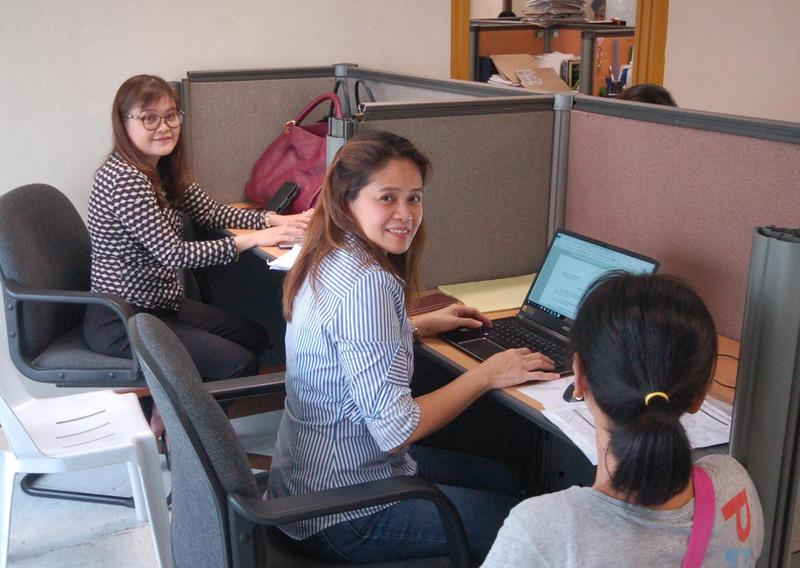 Senior Associate Sheila Sison (with laptop) finalizing a requested document for a client during the February 21, 2018 legal aid clinic. The Firm’s three legal aid clinics successfully assisted more than 300 indigent residents because of its partnership with the clients and friends shown above. 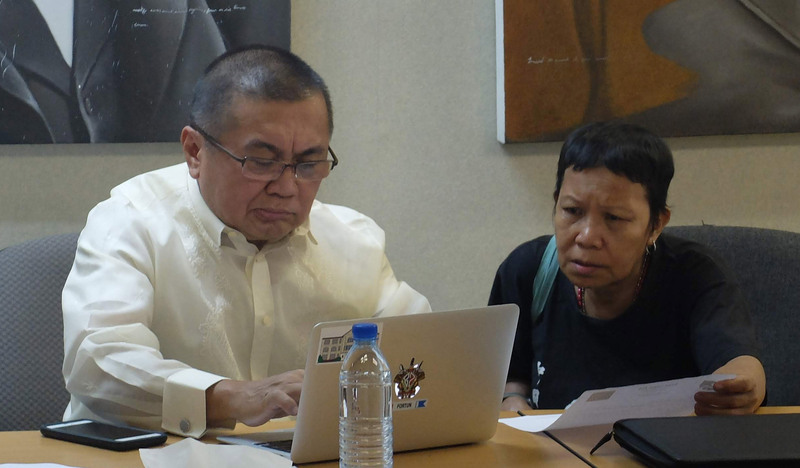 Senior Partner Ogie Narvasa consulting with an indigent client during the April 25, 2018 legal aid clinic at the Makati City Hall. 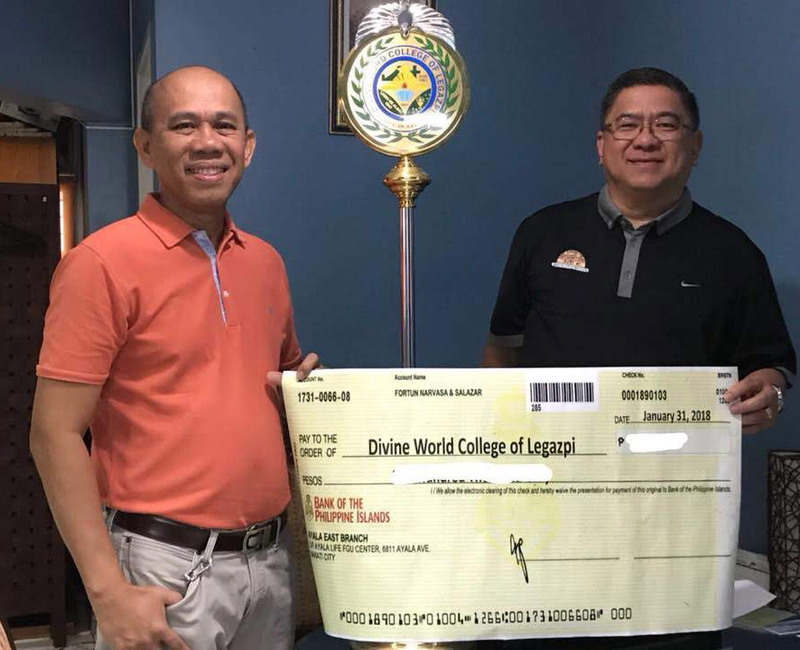 When Mayon Volcano erupted in January of this year, Senior Partner Dicky Salazar, a native of Legazpi City, Albay Province, quickly mustered resources from the Firm, its family and friends to help out in the relief and rehabilitation efforts of Divine Word College of Legazpi. Dicky, on behalf of our Firm, personally went to Mauraro High School in Guinobatan, Albay to assist in the distribution of relief goods to the families who were forced to evacuate because of the calamity. He also turned over additional funds to the organizers of the relief effort. 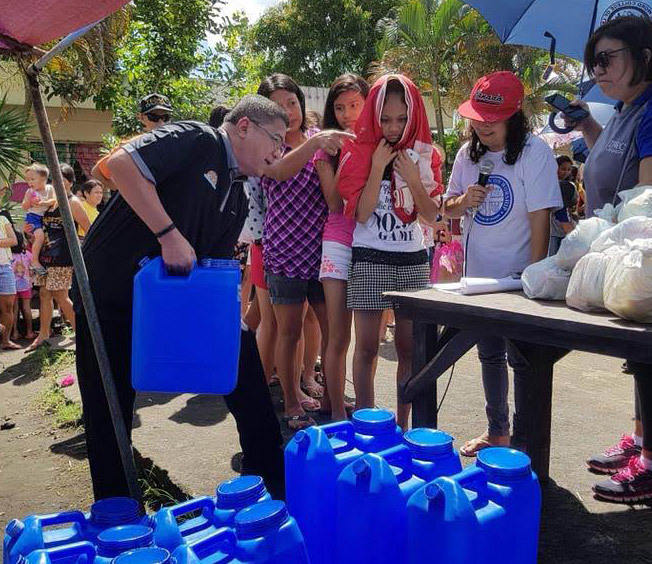 Senior Partner Dicky heaving 5-gallons in preparation for the distribution of the relief goods to the affected families of the Mt. Mayon eruption in January 2018. Senior Partner Dicky turning over relief funds to Rev. Fr. Nielo M. Cantilado, SVD, Preisdent of Divine Word College of Legazpi donated by the Firm. 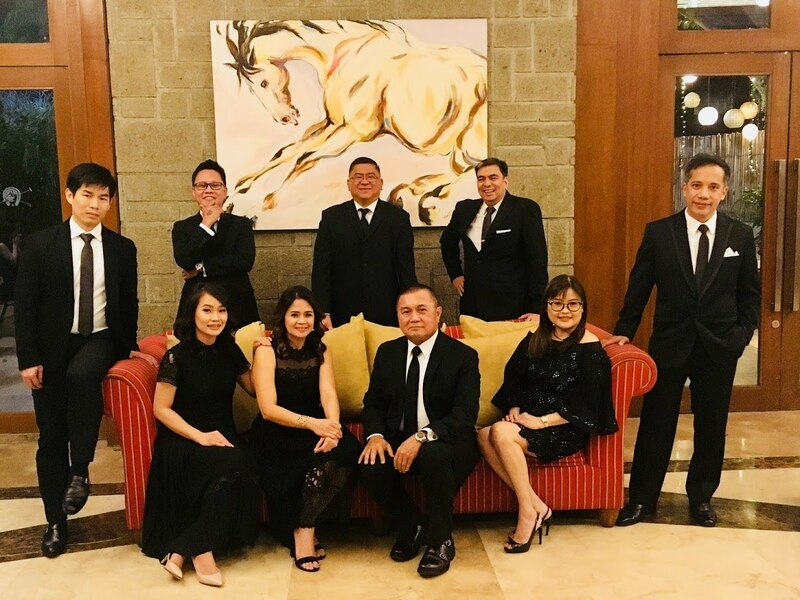 The lawyers of the Firm dressed up to the nines and celebrated in advance the birthday of Senior Partner Sig Fortun at the Manila Polo Club last March 9, 2018. Sadly, this was also the last time the Firm got to enjoy the amazing company of Senior Counsel Gloria A. Fortun, who passed two weeks later. 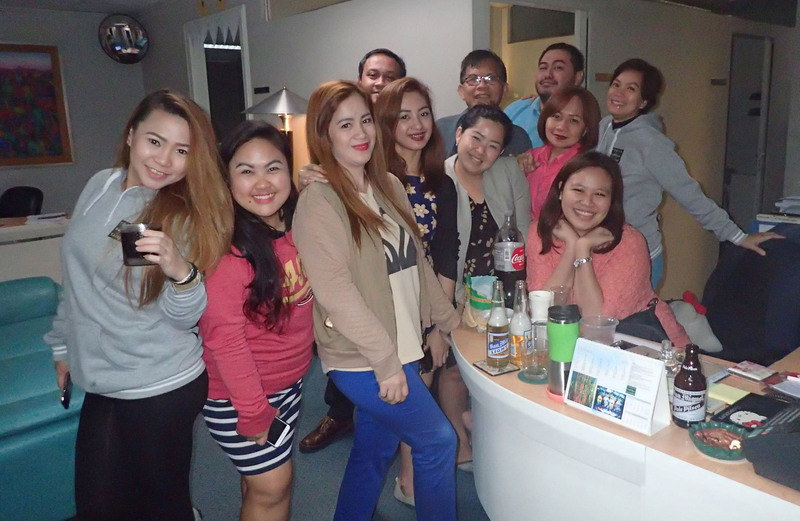 Partners of Firm looking buena familia during the coffee table book photoshoot. From left, on the couch, Ann Viray, Maricar Lazaro, Sig Fortun, and Myls Creencia, as Walter Go, Karl Castillo, Dicky Salazar, Ogie Narvasa and Bay Loste beam with pride. 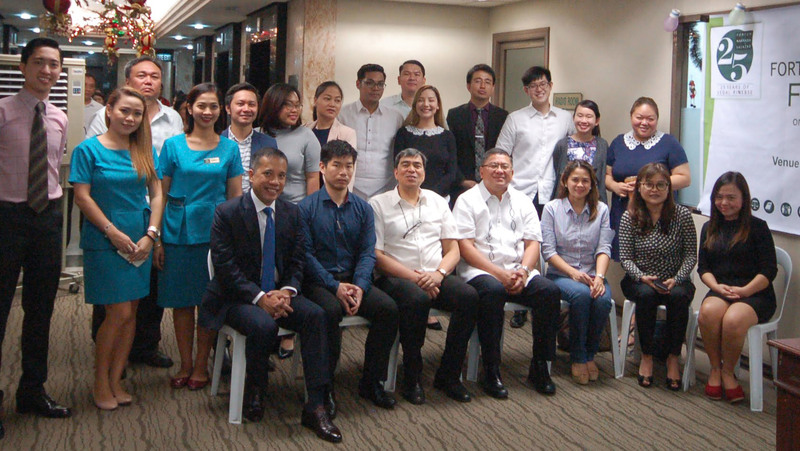 Senior Partners Sig, Ogie and Dicky and Junior Partner, Bay Loste, all trace their legal academic training from the University of the Philippines College of Law. 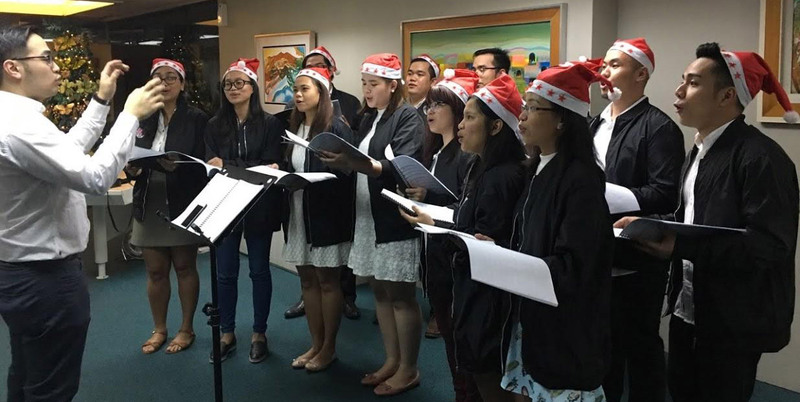 To rekindle their ties, the Firm hosted the law student choral group of the College to serenade the lawyers and staff just before the Christmas break in 2017. 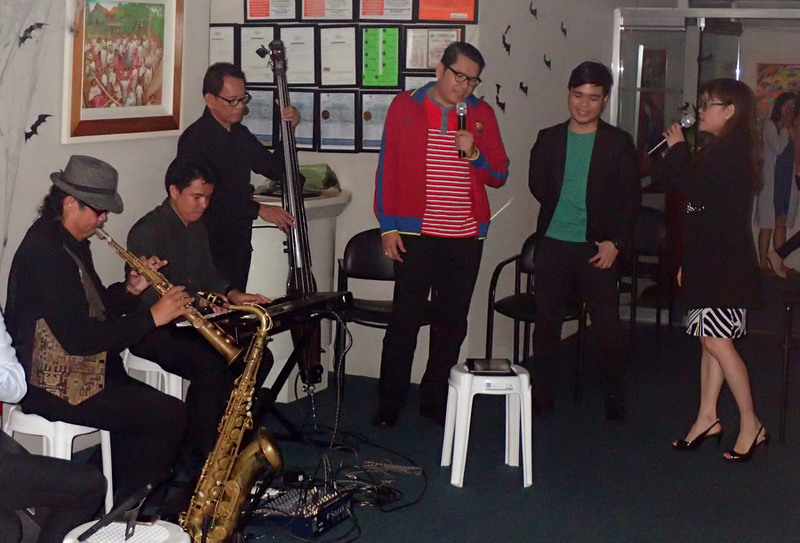 The UP LAW Charivari warmed the hearts of the lawyers and staff of the Firm in a pre-Christmas caroling. Senior Partner Sig Fortun’s idea of marking a quarter of a century of innovative and ingenious approach to the practice of law is to highlight each month with the vocal and musical talents of the members of the Firm. From the run-up months to as recent as October 30th, the lawyers and staff of the Firm sang their hearts out while being backed by professional musicians. 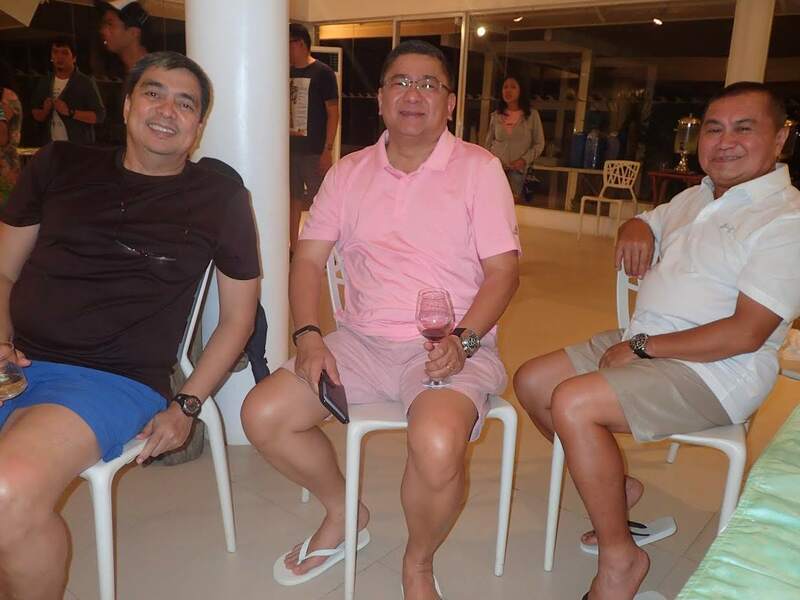 From left, former FNS Senior Associate now Presidential Commission on Good Government Commissioner Reynold Munsayac enjoying a night of music on September 29, 2017 with Partners Bay Loste, Sig Fortun, Dicky Salazar and Karl Castillo. 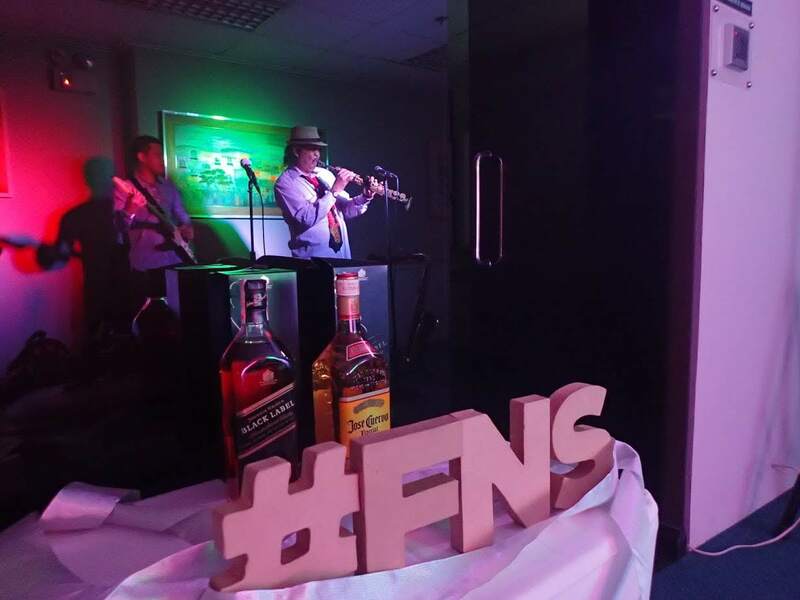 Jazz Night at FNS on August 11, 2017 as part of the run-up to the 25th Anniversary of the Firm. Firm’s administrative staff enjoying the Halloween 2018 evening. The lawyers of the Firm in high spirits during Halloween 2018. 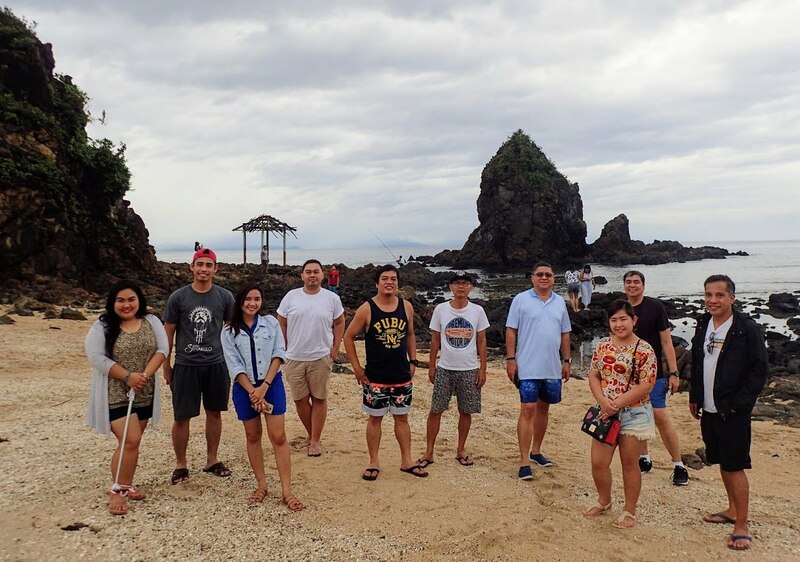 For the Firm’s summer outing, the entire office spent a July weekend surfing the waves of Baler, Aurora Province. 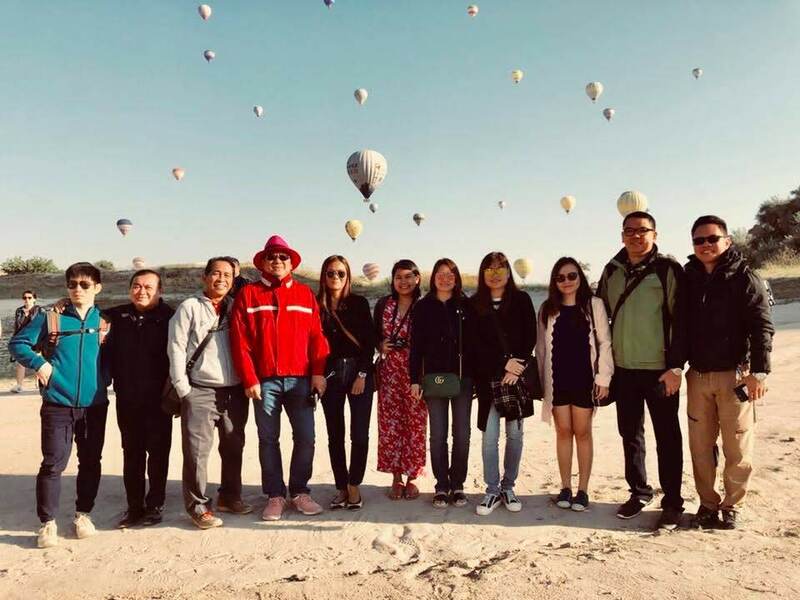 The lawyers and staff also soaked up on the history of the town and relished the natural beauty of the eastern seaboard of Luzon. Team FNS visiting the rock formations on the coast of Baler. 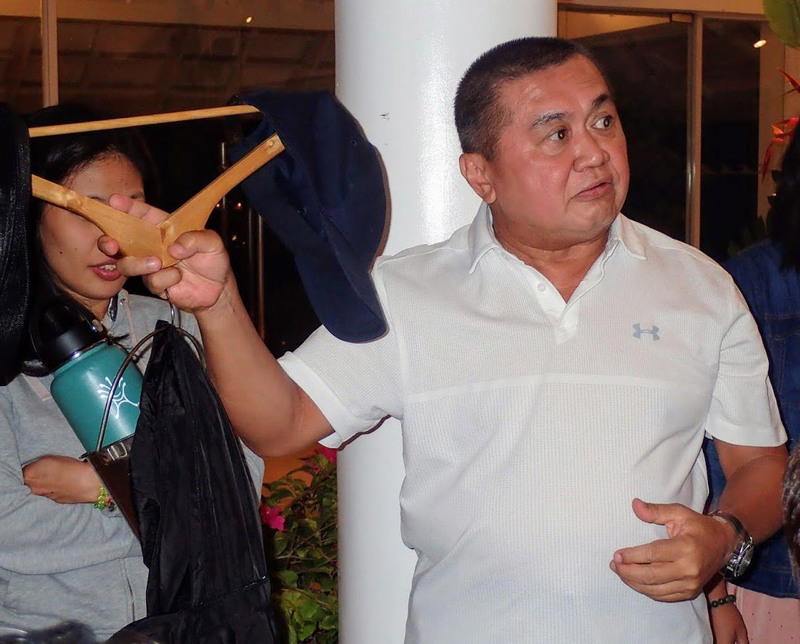 Founding Partner Sig Fortun inventing uses for clothes hanger during the evening games. The Big Three savoring the warm Baler evening. 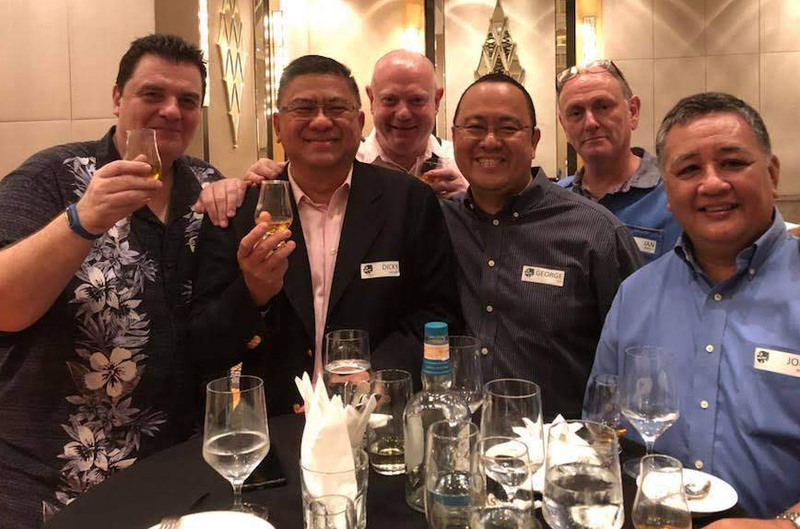 Senior Partner Dicky Salazar hosted a whiskey tasting evening compliments of client Pernod Ricard on the occasion of his birth month. 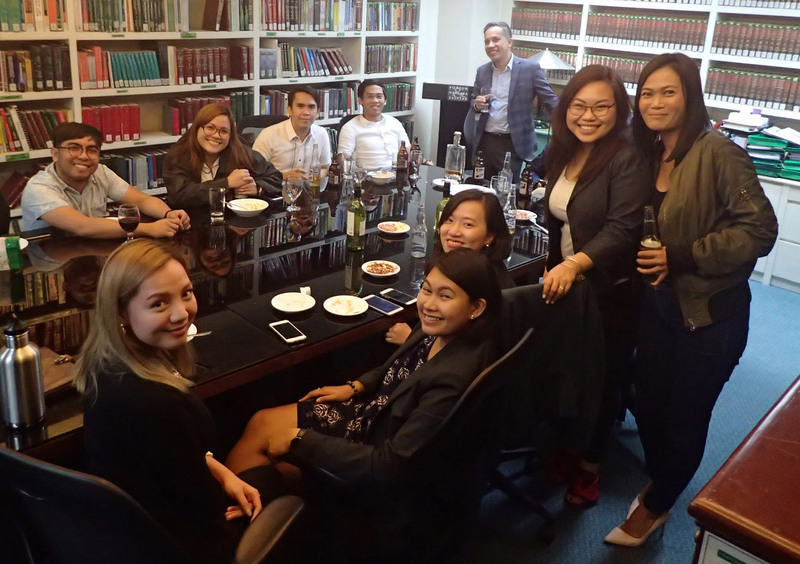 Lawyers, clients and friends of the Firm were treated to four different whiskeys of Chivas Regal and Glenlivet as they savored a leg of jamon iberico bellota courtesy of client Bares and Estrellas. Senior Partner Dicky Salazar celebrates his birth month together with clients, Thomas Wintermahr of Maccaferri Philippines, Inc., Rudi Rautenbach of Mineconsult, Inc., Ian Winter of QED Philippines, Inc., Joey Ayson of SEMCO Exploration and Mining Corporation and President of Philippine Mining and Exploration Association, of which Dicky is also a Trustee, and George Yap of SANDVIK Corporation. 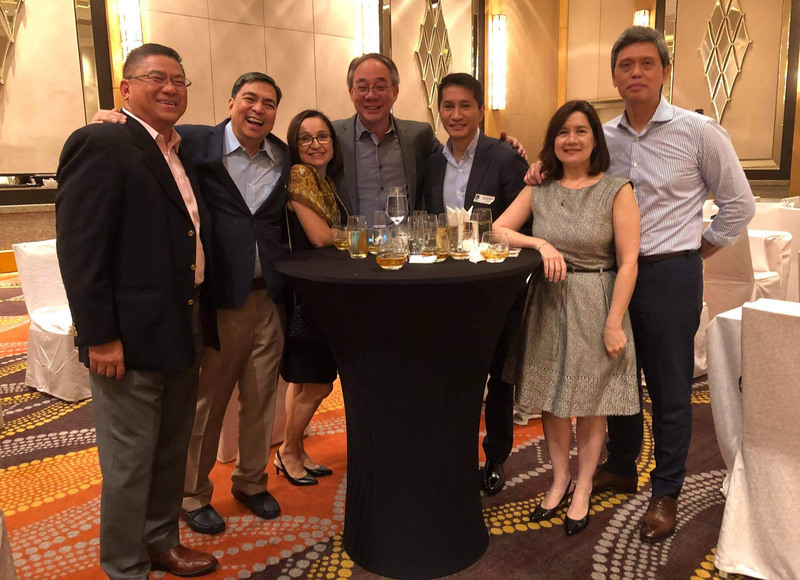 From left, Senior Partners Dicky Salazar and Ogie Narvasa together with close friends of the Firm Teresa and Litong Limcaoco, Glenn Figueroa, Carla and Butch Escober. 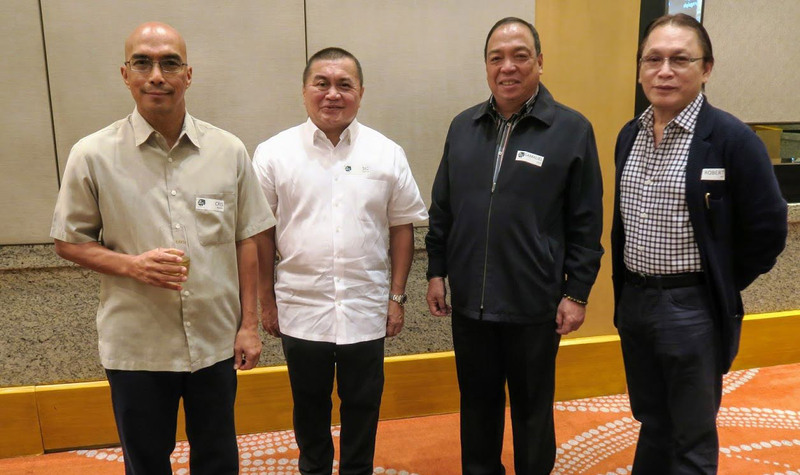 Senior Partner Sig Fortun (second from left) together with guests Crispiniano Acosta, President of Masbate Gold Corporation, Gamaliel Cruz, former Chief of the Philippine Army Support Command, and Robert Yap, President of an IT company. These three gentlemen are PMA graduates and members of Sandigan '82, of which Sig Fortun is an honorary member. 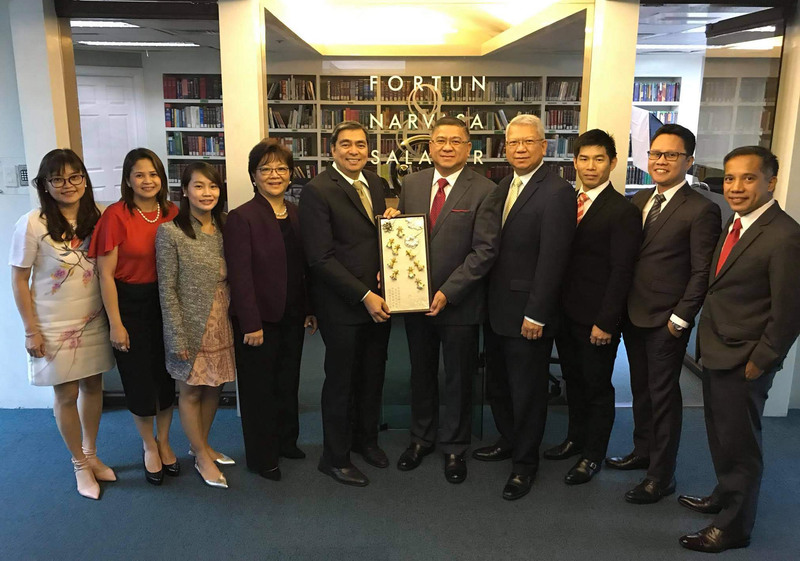 FNS Hong Kong Senior Counsel Randolph Salazar and wife, Lulu, presented a Gold Fish Plaque Gift (Royal Selangor) to the Firm on July 25, 2018 on the occasion of the 25th Anniversary of the Office. The plaque consisted of 9 goldfish representing the 9 Partners of the Firm. Ms. Lulu Salazar (4th from left) and FNS HK Senior Counsel Randy Salazar (4th from right) handing over to Ogie Narvasa and Dicky Salazar the Gold Fish Plaque. Myls Creencia, Maricar Lazaro, Ann De Jesus-Viray, Walter Go, Karl Castillo and Bay Loste flank the four. The Firm believes in the maxim mens sana in corpore sano (a healthy mind in a healthy body). To challenge its lawyers and staff, Senior Partner Sig Fortun led a spin class at Ride Revolution. Everyone who participated proved that they still have the stamina, grit, and grind to perform ordinary human tasks like riding a stationary bike. All smiles as the lawyers and staff of the Firm relish the post-workout adrenaline rush. 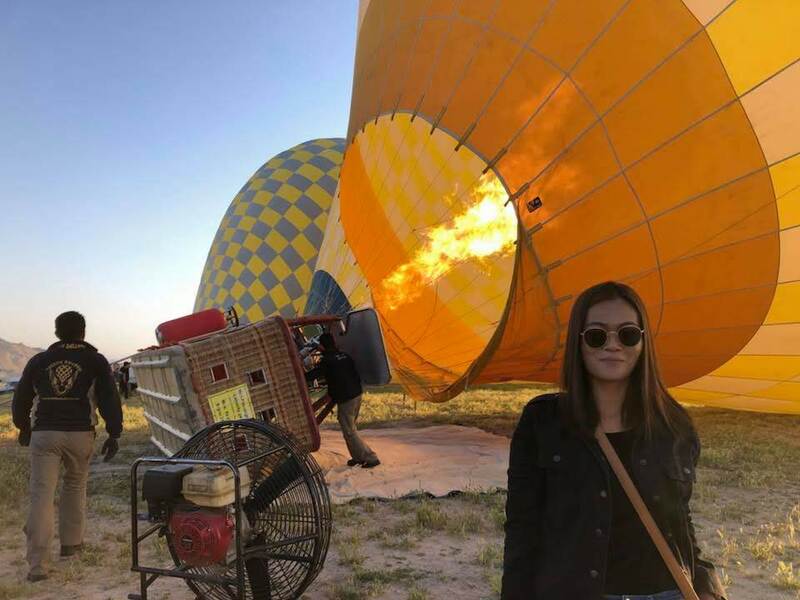 The lawyers of the Firm took the skies when they visited Cappadocia, Turkey onboard air balloons as they celebrated the 25th year. They also visited the markets of Istanbul and tasted the sights and sounds of the City that bridges the East and West. 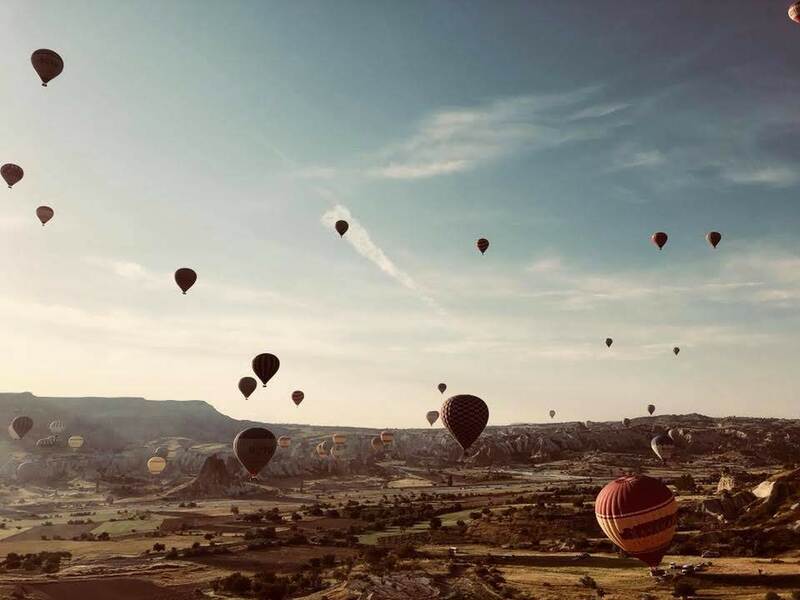 Air balloons in flight above Cappadocia, Turkey, photograph taken by Sheila Sison. 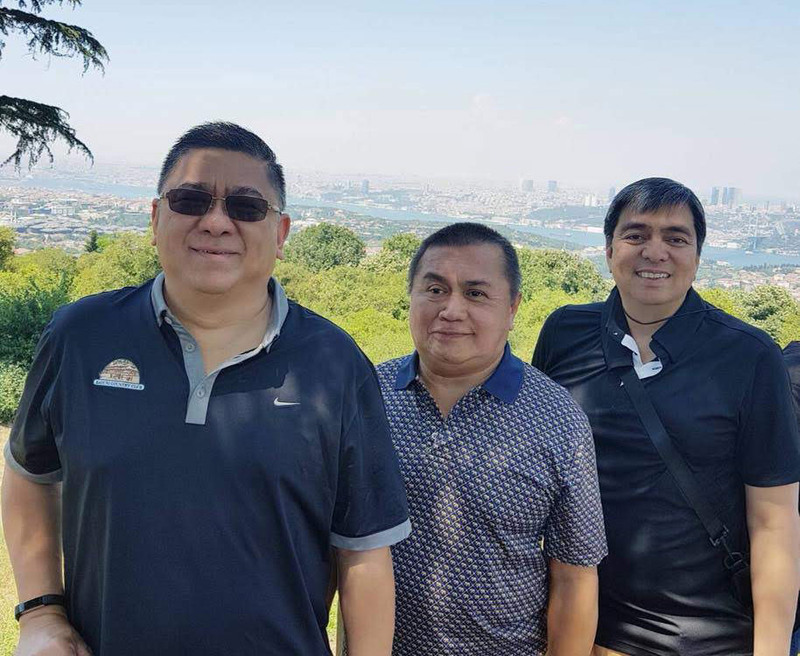 Senior Partners Dicky Salazar, Sig Fortun and Ogie Narvasa with the Bosporus Strait in the background. 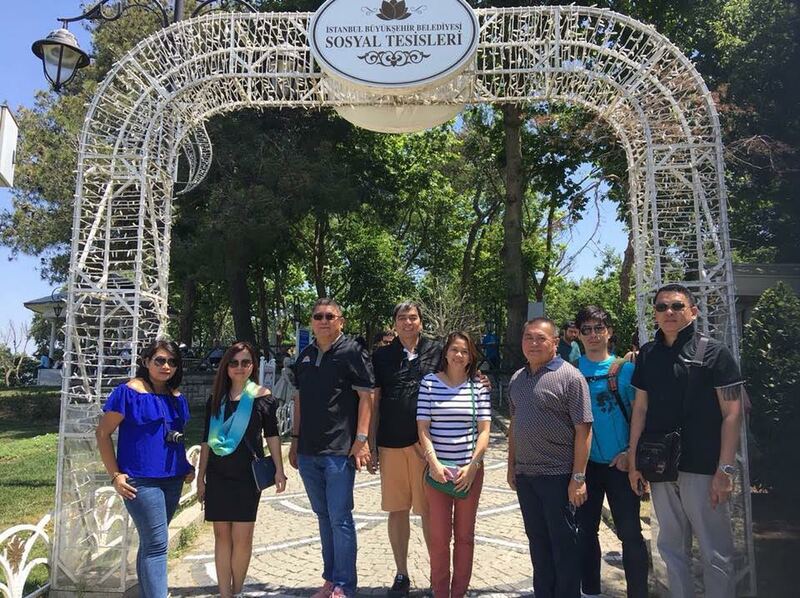 From left, Hope Patagan, Tine Ferrer, Dicky Salazar, Ogie Narvasa, Maricar Lazaro, Sig Fortun, Walter Go, and Tammy Tamondong touring one of the gardens in Istanbul. 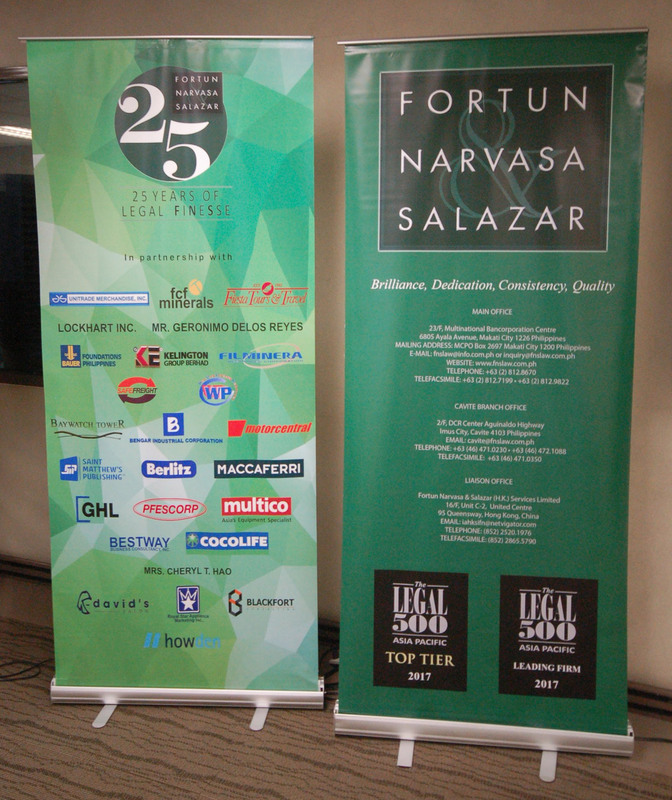 As clients and friends will attest, our Office has one of the most varied art collections in the Makati legal scene. 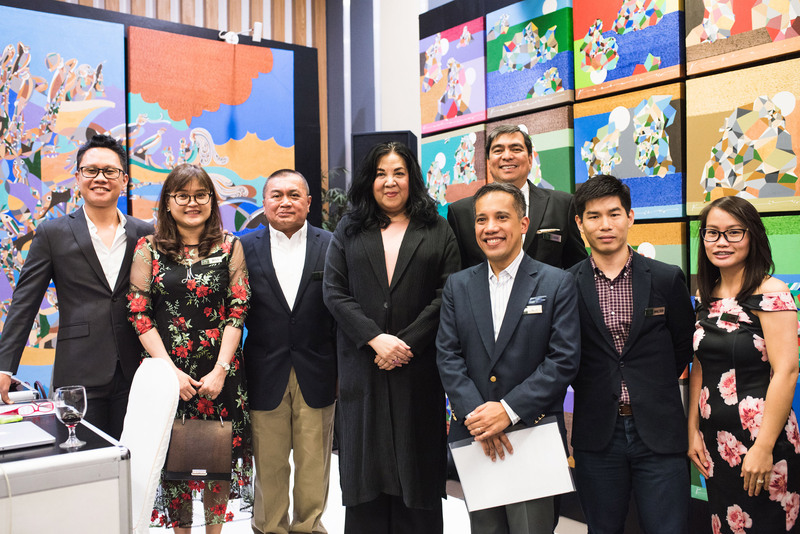 To show our appreciation to artists and art aficionados alike, we launched the 25th anniversary celebration of the Firm during the MANILART 2017 through an art talk by curator and art historian Ms. Lisa Guerrero Nakpil. Partners Karl, Myls, Sig, Ogie, Bay, Walter, and Ann, together with Ms. Lisa Guerrero Nakpil during MANILART 2017.